What Is Otosclerosis? In simple terms otosclerosis is caused by abnormal growth and development of the very delicate bone of the middle ear.Normally otosclerosis affects the very tiny stapes bone, though very occasionally the cochlea, which is found deep in the middle ear, just before the entrance to the inner ear. This bone breaks down and regenerates itself continually producing new fresh bone growth; it is thought that during the regeneration phase, a fault occurs resulting in abnormal bone growth that causes obstruction to the entrance of the inner ear. This obstruction prevents the normal passage of sound waves through the ear compartments, which are normally flexible to sound waves, though with otosclerosis become static, resulting in hearing interference or hearing loss. This loss can be minor or severe and usually involves both ears, very rarely just one. The main causes of this condition are largely not known, though experts believe that genetics can play a role as research has indicated that parents can pass down the condition to their offspring.Research has also indicated a link between measles and the development of otosclerosis though more research is needed in this area to confirm the exact link between the two.Otosclerosis seems to be twice as apparent in women than men, and affects mainly white middle-aged females; the reasons for this are not yet understood. Sufferers normally present to their GP with hearing impairment that has usually deteriorated over time. The first stage of hearing loss due to this condition is the absence of the ability to hear low pitched or soft or muffled sounds.Along with the hearing loss, sufferers have also reported episodes of dizziness, lack of balance and tinnitus. Once an ear health specialist has confirmed otosclerosis, thorough discussion will take place in order to ascertain the best treatment option. In some cases surgery will be indicated, though this is not without risks, all of which will have to be explained and considered before the patient can give informed consent. Associated risks include failure to correct the problem, long-term tinnitus or worsening of the hearing loss, in some cases total absence of the ability to hear. If surgery is opted for, the usual procedure is called a stapedectomy during which the surgeon uses a prosthetic device to bypass the affected area allowing for sound waves to transmit throughout the ear without being obstructed. If surgery is not considered, normally if the hearing loss is not severe, or other bony areas of the middle ear are involved, the use of a hearing aid may help to regain some hearing function. These devices should be prescribed and fitted by a trained professional, not bought from a newspaper or magazine as these are not true hearing aids, merely amplifying gadgets. 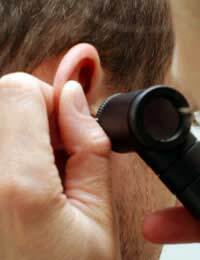 Otosclerosis can be very debilitating condition that can go unnoticed by the sufferer in its initial stages due to its development and deterioration over time.Any degree of prolonged hearing loss, especially of unknown cause, should be investigated by both a GP and a specialist in order to determine and treat the cause.